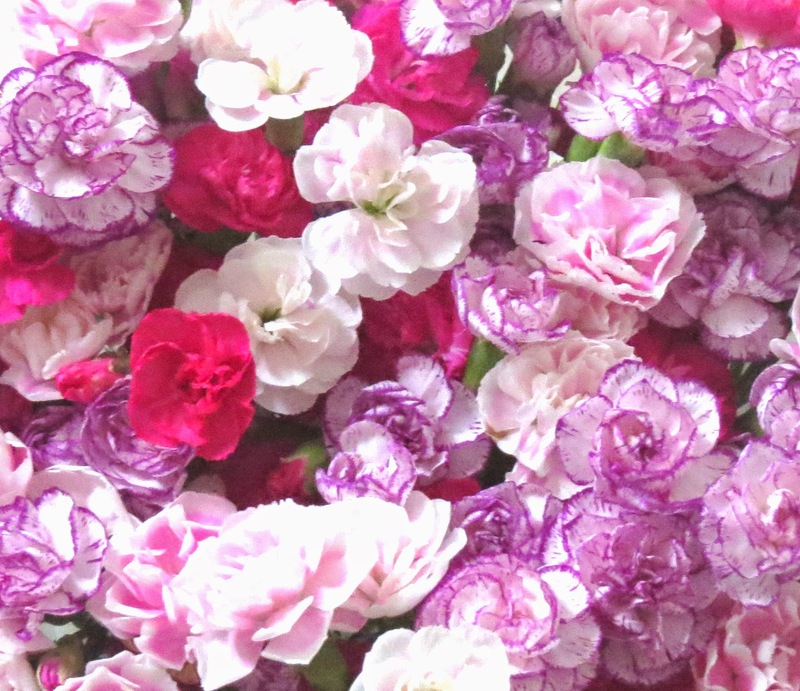 As I mentioned before, I simply love carnations. Their frilly, feminine blooms ought to give roses and peonies a run for their money in the romance stakes, but alas, they're often overlooked and thought to be cheap and boring. Cheap they are (which is part of their appeal) but carnations are never ever boring. 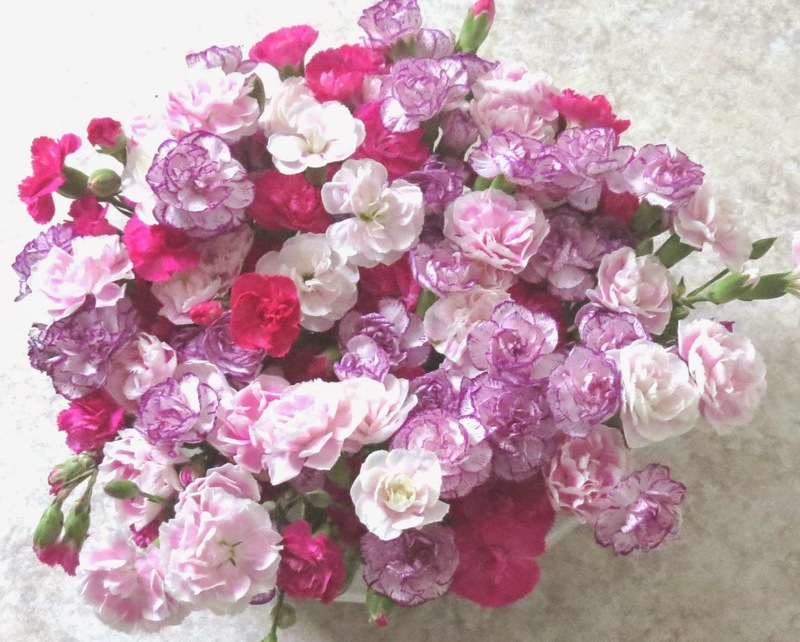 I currently have a bowl of pink and purple carnations on my kitchen table which are in full, perfect, healthy bloom - seventeen days after I bought them, and I reckon I still have a good week to go before they start to die. Seeing's as they cost £1.50 per bunch in Lidl - I like to think they represent some of the best value for money in terms of cut flowers. 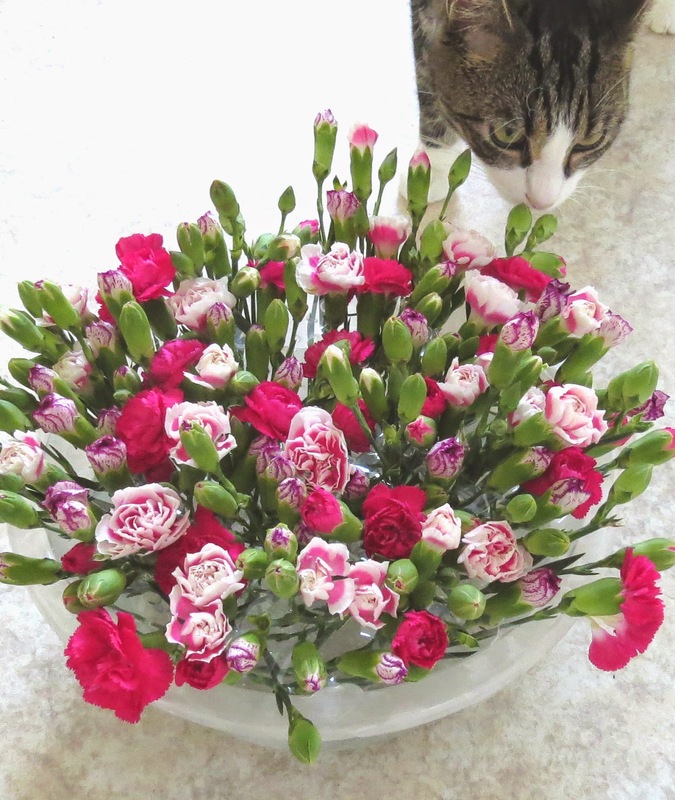 You can have a lot of fun displaying carnations, because they're not fussy about having their water changed as often as a lot of other flowers, and using a rose bowl (or this home made version) creates a lovely puffy "cloud" of flowers that looks beautiful in any colour combination. I've been to a wedding that used carnations displayed using this exact method, with white flowers only, as table centrepieces - cheap, easy to DIY, and perfectly high impact (whilst being low enough to let guests talk across the table), but this is versatile enough that it works just as well at home, even if you live in a room in halls at uni. All you need is a bowl (have a look in your local charity shop for treasures like cut crystal fruit bowls, nobody wants these any more but they look kind of vintage-quirky and will probably be a steal at a couple of pounds), a roll of cello-tape (the thinner the better), a drinking straw, scissors, and a selection of carnations. 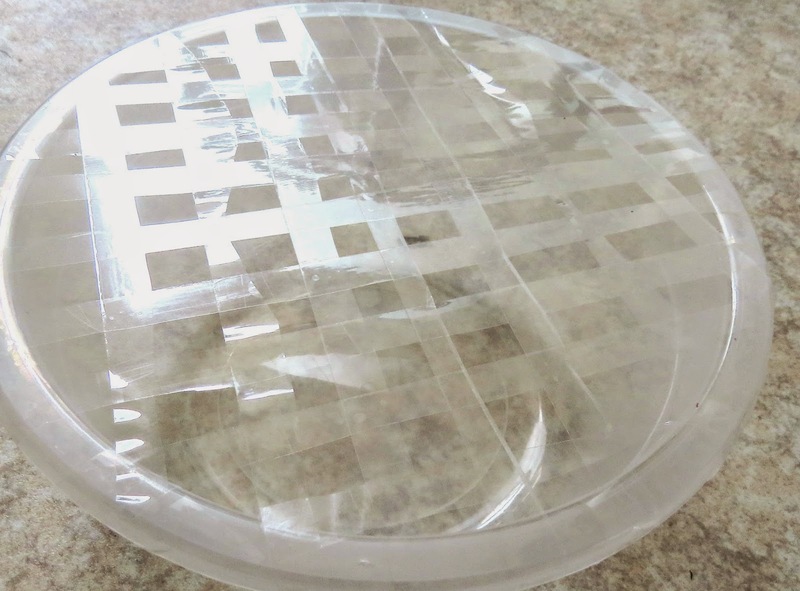 Use the cello-tape to create a "grid" across your bowl, if your bowl has a "lip" at the edge then you can tuck the ends of the tape under, if not just make sure you don't have too much excess tape stuck to the side of the bowl. Use a drinking straw to measure the length from the base of the bowl to the outside of the tape, and cut the straw to this length - you can then use this as a guide to cutting the stems of your carnations so that they sit perfectly. Trim all of the flowers at a forty five degree angle, half fill the bowl with water (and treat as per preference, either with plant food or an alternative), then poke the flowers through the squares in your grid. More than one bloom can share a square. If your flowers are in bud (which I'd recommend, as they'll last longer) then you'll be able to see the cello-tape grid at first, but be patient, the flowers will soon open up and render your DIY efforts invisible - what you'll be left with is a bowl overflowing with beautiful flowers. If you'd like advice on how to make your cut flowers last longer at home, or you want some ideas for alternatives to generic cut flower food, then read my previous post here.